Round One of the Southern Sweets Showdown rolls on with match-ups between the eight and nine seeds. Next up, from the Cakes, Puddings & Ice Cream Region, we have the 8-seed Coconut Cake squaring up against the 9-seed Apple Stack Cake. 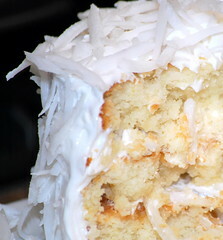 Coconut Cakes is a ubiquitous treat at Southern gatherings, whether it be in its traditional form at a potluck supper or colored an unholy pink and shaped like a bunny for Easter. I don’t know what it is about Coconut, but something about its rich, tropical flavor speaks to the Southern soul. Maybe adding a little coconut to an otherwise traditional recipe makes us feel like we’re dabbling in the exotic. For this RSM, the Apple Stack Cake is a bit of a mystery. I grew up on the Gulf Coast, and these cakes seem to be more of an Appalachian tradition. According to this story out of Knoxville, the cakes were a traditional gift at mountain weddings. 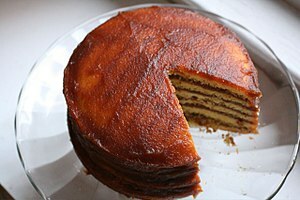 Guests would each bring a layer, and the hostess would add the dried-apple filling between. The more popular the bride, the taller the cake. They say it tastes a bit like biscuits and apple butter, and the cakes can be very heavy. There’s no part of that description a Real Southern Man doesn’t like. The Results are in for the 8 vs 9 Seeds!